American Holly (ilex opaca), also known as christmas holly or white holly is a popular and valuable evergreen tree, native to the Eastern United States. It is grown and adapts readily in hardiness zones 5 through 9. Ilex opaca has been extensively hybridized and there are literally hundreds of cultivars available, including some with variegated foliage and improved berry size and color. Holly trees prefer a part sun to mostly shady location with moist, slightly acid and well drained soil conditions. They have a very symmetrical growth pattern and make perfect specimens alone, planted in groups or as a living fence you will never have to trim. American Holly is easily identifiable by its dark green and glossy leaves which have a leathery texture and tough sharp spines. The bark is a pleasingly mottled light grey in color which sets off the dense foliage. Trees have a lush dense growing habit and produce an abundance of small white blossoms in late spring. These are followed by drupes of green berries which mature during the autumn months to the familiar, highly decorative, bright red fruit. The foliage and berries are commonly used for holiday decorations. The berries also provide forage and are a valuable source of food in the wintertime for birds and wildlife. Due to their symmetrical growth habits, pruning is generally not necessary. However, if you need to shape it, you can cut back the tips of new growth any time from late summer on through winter. For more severe pruning or if you need to scale down the size of holly, wait until December or January when the plant is dormant. You can cut back branches as much as three fourths of their length. This will result in a barren look until spring when new foliage will begin to fill in the gaps. Holly may be propagated from seed, but this is a slow and uncertain procedure. The better and most used method is by using semi-hardwood cuttings. These are taken in the late part of summer from current year's growth that is partially mature and just starting to become woody. Cuttings should be 5 to 6 inches long, made just below a node. Strip off lower leaves and use a rooting compound. Place cuttings in a mixture of half and half potting soil and sand and keep evenly moist at all times. Keep container in a bright location. You may want to cover it with plastic to conserve humidity and aid in root formation. 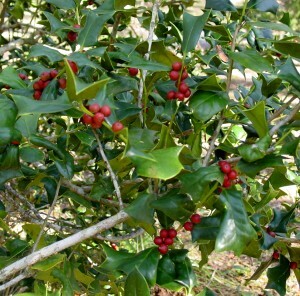 If you have the room and want year-round color, consider the American Holly. Although slow growing, hollies can attain heights of up to 60 feet at maturity. Remember this at planting time. You will want to stay a good distance from any structure because the branches start low on the trunk and can grow 15 feet or more in length.